Abbey Archery Organic Search Engine Traffic Up 800% Nov 1 2009. Over the 2 years to October 31, 2009, organic referrals from search engines increased by 800%. Says Abbey Archery Manager, Tony Dalton "We keep thinking that the traffic has peaked but again and again, new records are set. From time to time referrals decline a little then they increase, each time to a further record. Rather than falling off, the increase continues." 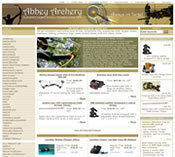 Abbey Archery triples Targeted Organic Search Engine Traffic June 1 2008. Over the 9 months to May 31, 2008, Abbey Archery tripled its referrals from search engines and quadrupled its sales. Says Abbey Archery Manager, Tony Dalton "The results are just astounding. IME set our store up to be search engine friendly plus we have followed every bit of advice they have given us as how to provide quality content both for visitors and search engines. Nearly every week we are seeing new records - every week we think that the traffic must peak soon and pretty much every week it has been a new record. We are over the moon with the results achieved by IME". IME completes Online Store for Australia's Largest Archery Supplies Company - Abbey Archery: May 10 2007. Includes merchandising features such as customers can review their order history and reorder from it, save their carts, examine freight charges before checking out, track orders, review products, see featured products, best sellers, specials, receive automatic coupons, receive automatic post sale follow ups and automatically receive discounts based on order history. Also includes many features to make store management more efficient and more effective such as complete integration with warehouse and retail store, integrated real time inventory control, easy processing of returns and credits, detailed analytics to track all referrals to sales, abandoned cart analysis, bulk upload of product and category data, warehouse packing slips, delivery slips, wholesale customers see their special pricing and low and out of stock email alerts, by product. and profits of your Web store! Making it as simple and easy as possible for those visitors to buy your products and services. Visitor behavior - what visitors are actually doing whilst on your store pages. Where they go, what links they click on, where they hesitate, where they don't go. We even provide heat maps. Buyer behavior - what forms they had trouble with and with which specific fields, abandoned baskets, ease and clarity of the checkout. We can provide heat maps here too. Usability - how easy it is for visitors and customers to find the information they want, to navigate your store and to buy. How visitors arrived at your store and methods to increase your targeted traffic. How your store stacks up against your competition - both online competitors and bricks and mortar competitors. Methods to increase sales to existing customers - maximising each sale and generation of repeat sales. Store Administration - methods to cut administration time and costs so you can devote those resources to merchandising. We build online stores and we improve online stores. Take control - wring extra profits from your existing business. Drive up traffic and sales. We'll help you improve the success of your Web business, increase your ROI and maximize sales and profits. Give us a try - you'll find the quality of our services surprisingly affordable. "We have thousands of products and a complex product range. We never had an online store before as we had been daunted at the task but IME designed and built our online store from the ground up and trained us. We have made a seamless and relatively easy transition. Our site is very quick to load & navigate and our store is packed with features, works faultlessly and is proving very popular with both customers and search engines alike. We couldn't be happier with our results." "Before we created our store we asked IME to advise us on operating systems. Their advice proved very sound and enabled us to get a fast start for our online store." "Shopping cart design and implementation is not for the faint-hearted. It is easy to make a mistake and end up with a missing homepage and no customers. So it is best left to the experts and IME was our first choice to get the Miva site up and running without the hassle. Sales grew immediately and continue to do so and IME's ongoing support is top-notch. We would recommend them without hesitation!" "We had an existing website but needed to add an online store so our customers could order online rather than just by phone, fax or e-mail. IME built an online store which integrated nicely with the existing website and which made store management easy. Our store has been very successful, helped us reduce costs through greater efficiency, made inventory management easier and best of all, our customers love it." Web business tips from Jimworld's OAC. SEO tool. Analyze your pages and those of your competitors - top 20 keyword phrases. How to create search engine friendly links for Miva Merchant 5 online stores. Best Format for Short URLs. How to create better search engine friendly links for your Web store. Copyright © 2000-2011 Internet Marketing Engine Australia USA. All rights reserved.